The UX practitioner’s emerging role in personalization design. Identifying cultural differences is vital to cross-cultural design. So much of being successful as a designer depends on relationships with cross-functional partners. Designing for children requires distinct usability approaches, including targeting content narrowly for children of different ages. The gimmick of Jobs To Be Done only works in certain situations. Designing for Digital is excited to host a workshop by Brad Frost, a luminary in web design. 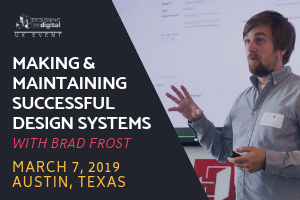 This all-day workshop covering Design Systems will take place on March 7th in Austin, TX. Purchase today! Events worth checking out for UX researchers. A spreadsheet of UX research tools. Design patterns from mobile apps that you can transform into code with one click. A curated list of mobile design resources. Eric leads the digital design team at Herman Miller. Join Snowball’s product design team designing the most efficient and pleasant user experiences for their customers products.